On The Road To Stanley’s Cup? There is a growing fervor in the city of Montreal despite winter trying its best to maintain a grip on the island, that one beautiful unifying force that transcends language, race and creed which brings us all together under the same flag. Your Montreal Canadiens are heading into the playoffs and are back on the road to the Stanley Cup, having punched their ticket to start the month of April off despite a loss to their likely opponents in the first round, Tampa Bay. This is the team that orchestrated one of the greatest comebacks in NHL history against the Ottawa Senators with less than four minutes left, down by three goals only to come back, tie it up and then win 5-4 in overtime. This is the team that welcomed Patrick Roy back again to Montreal and put on an impressive offensive show with newly acquired Thomas Vanek headlining the 6-3 victory over the Colorado Avalanche with his first 3 goals as a Hab. This is the team that walked into Boston against a Bruins team that was on a 12 game winning streak and ended that on the shootout winning goal of Alex Galchenyuk. This is the Habs we love, winning every way possible even in the most dire of situations against great teams, whether they’re rivals or not. Time and time again the Habs have shown this season they have what it takes to pull out victories in games they seemingly have no business being in. Yet if there’s one strong message the Montreal Canadiens should take from their comeback win over the Senators, it is to be cautious of what happens when the team stops playing for the entire 60 minutes. The Montreal Canadiens are a team that is in serious danger of being eliminated in the first round, despite being winners of eight of their last ten heading into Chicago. I look back to that game in Florida at the end of March against a Panthers team that has been in the basement of the Eastern Conference for most of the season. The 4-1 final score of that game is incredibly misleading, as the Panthers spent long stretches of time in the Canadiens end and despite the lack of firepower had 37 shots on goal compared to Montreals 19. To put this in perspective, Montreal only led in shots on goal in the first period when things were fairly even at 11 to 10. The most troubling being the 3 shots mustered in the third compared to Florida’s 15. Looking at this as a single game, this isn’t something to be fretful about; however I distinctly remember thinking to myself how Montreal cannot afford to play with their foot off the pedal against better teams no matter how good Thomas Vanek, David Desharnais and Max Pacioretty play heading in. This wasn’t more evident than against the Tampa Bay Lightning, a team who Montreal is nearly mathematically guaranteed to face in the first round. Tampa Bay throughout this game had innumerable scoring chances with Montreal’s saving grace being the play of Carey Price who made several spectacular saves to keep the score to this game respectable. Time after time, Tampa Bay not only generated the better scoring chances but they used their speed in a way that forced Montreal to rack up the penalty minutes. Often times we hear the term speed kills, usually in reference to Montreal against other teams. However the Bolts are not the Bruins, and they are a team that is built for speed and skill and if not for Price this game could’ve ended much quicker than it did. Going into the third period with a tie game, Montreal once again stopped playing and was outshot 12 to 6 by Tampa Bay. Even in the Habs 7-4 victory over the Senators, they were outplayed for stretches of the game with Ottawa putting 43 shots on Budaj compared to the 23 on Anderson. While the victory was exciting for most fans to watch, the lack of discipline and the absence of a full 60 minute effort was once again a glaring hole that was shadowed by Montreal’s victory. The most recent victory over Detroit is another glaring example of Montreal’s inability to dictate the play and rhythm of the game with another significant drop in effort against a hungry and tireless Detroit team that nearly cost Montreal the game in the third. These sorts of scares need to be avoided, because when you let another team back into the game more often than not you’ll pay the price for it. While being successful, there are a number of problems that need to be addressed before Montreal collides with Tampa Bay in the first round. This team needs to learn to dictate the game to their pace and not allow their opponents to take over and play their styles and spend so much time generating offense in the Canadiens zone. This recent development was how the Toronto Maple Leafs played for most of this season, allowing opponents to out shoot and out chance them but managing to score the goals they needed while being backstopped by great goaltending. It was only a matter of time for their glaring weaknesses to come full circle and the rug was pulled out from beneath them, so too it will be for Montreal very quickly against Tampa Bay if the Habs rely on superb shooting percentages and electrifying goaltending. After all it’s not every game you will have four shots in the second period and walk away with two goals like Montreal did against Detroit. These are exceptions and not the rule. Despite the poor possession numbers, there are some key things to take note of from Montreal’s recent successful stretch. 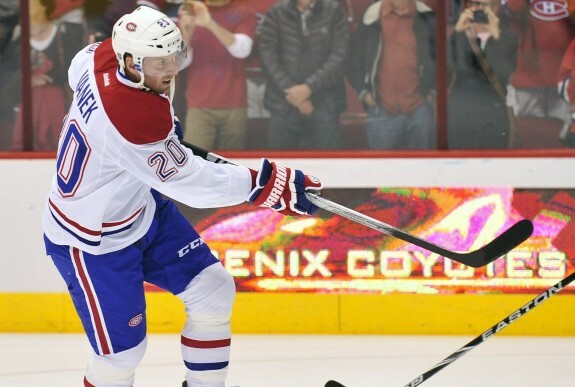 In the video above, watch how Rene Bourque, Brian Gionta and Lars Eller all head straight for the net after Jarred Tinordi took a wrist shot, using the boards at the Bell Centre help bounce the puck deep. Any one of those three could’ve gotten the goal that proceeded, it just so happened Eller went behind the net to catch Tinordi’s wrist shot and send it back out in front where both Bourque and Gionta were waiting. It wasn’t the prettiest, tic-tac-toe goal you’ll see but this goal and others like it we’ve seen through this stretch are the kinds of goals Montreal will need to continue to generate if they want success in the playoffs. Heading to the net was not something we saw the Habs do much in Tampa in their last game against the Bolts, and the final result backs that up. Even with Ben Bishop now injured that doesn’t necessarily mean this series will be easier for the Habs. Not when their once steady powerplay has stuttered so dramatically down the stretch. While the extra 5-on-5 scoring is great, their last meeting against Boston shows the importance of special teams. Both goals in regulation came on the powerplay for both teams and aside from Montreal regaining the discipline to play their games for a full 60 minutes, the powerplay is something the Habs will need clicking again in the playoffs when things get much tighter. Here they sit as the only Canadian team in the playoffs with a world class goaltender who has been playing some of the best hockey of his entire career. The addition of Vanek and the chemistry that he has with David Desharnais and Max Pacioretty has given the Montreal Canadiens a truly lethal number one line. It’s also easy to forget that the Habs have been playing without Dale Weiss, Brandon Prust and Travis Moen who are all still recovering from injuries. This speaks volumes to the organizational depth the Habs have and this is incredibly important heading into the playoffs where they’re not guaranteed to remain healthy. The problem is when Montreal allows their opponents so many more shots on goal, invariably these opponents will create better scoring chances. 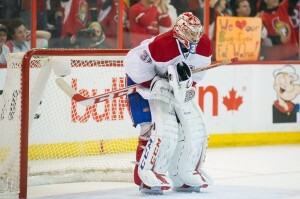 Can we really expect Carey Price to continually bail out the sluggish forwards and porous defense? If the Habs keep their foot on the pedal for the length of their games, their forwards aren’t so sluggish and their defense is far from porous and despite it all, perhaps these Canadiens can go deep in the playoffs. However if the Habs continue down this road, Tampa Bay will make them pay and despite all of the great games and story lines developed through this season Montreal will once again be bowing out early from the playoffs. Unless they can remain disciplined for a full 60 minutes and fix their slumping power play, we may see number 91 force us to sit solemnly with our memories of 93 for another year.